When arms are engraved, dots, hatching and cross-hatching is used to represent heraldic colours. The convention used today was published in 1638 by Sylvester Petra Sancta, an Italian Jesuit priest who produced two works on heraldry. We explain and illustrate the convention below and include in parenthesis the heraldic terms used. On the right we illustrate the technique in use. All three images are displayed in this page at about actual size, depending on the resolution setting of your monitor. 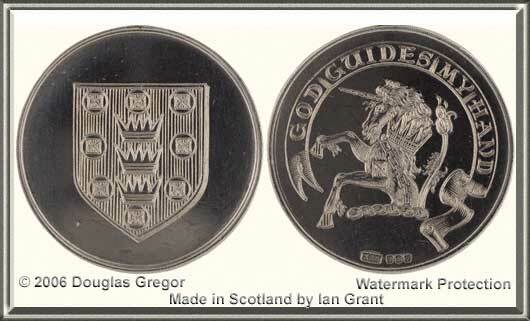 The first illustration is a silver medal with Ian Grant's shield on one side and his crest on the other. The lower left image is a lozenge In heraldry a lozenge is a diamond-shaped charge (an object that can be placed on the shield) and is normally narrower than it is tall. It is particularly associated with women as a means to display their coats of arms. In this instance Ian Grant's arms have been used, as for a lady, for illustration only. Many arms will not fit into this shape and so the Lord Lyon has now sanctioned the use of an oval shape as an alternative to the lozenge. 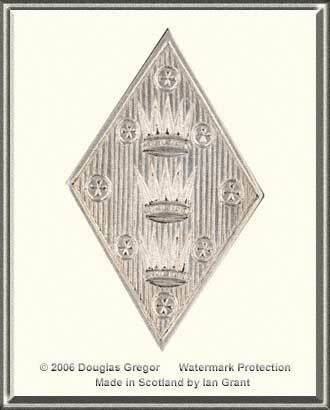 and the lower right is a tie pin showing the shield of the Heraldry Society of Scotland. The background of the Ian Grant shield is hatched with regular vertical lines indicating that the blazon specifies "gules" (red) for the shield. In the crest the hoofs of the unicorn and the crown are also "coloured" but the unicorn itself is not; the hatchings you see there do not correspond with the Petra Sanct system: they take a different, irregular, form and are used to add character and depth to the engraving. 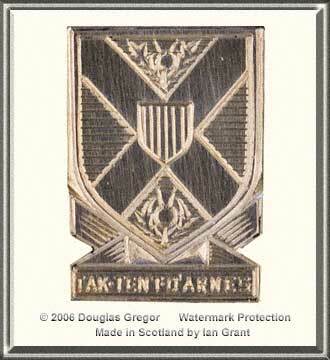 The shield on the tie pin comprises a saltire with a shield in the centre and thistles top centre and bottom centre. The small centre shield is hatched with vertical lines and so represents gules (red), the background of the saltre is azure (blue) and so is hatched with horizontal lines.